Salem was born in June of 1951 in Al Rahib, Menoufiya. He studied journalism at Cairo University — graduating in 1974 and also publishing his first major collection, My Beloved is Planted in the Soil’s Blood, in 1974. Salem published at least 18 poetry collections and won the State Excellence Prize in 2006, later rescinded because of his controversial “The Balcony of Laila Mourad.” However, this was not his last state-sponsored award: Salem’s 2011 collection Raise Your Head High won The Best Colloquial Poetry Collection Award at the 2012 Cairo International Book Fair. 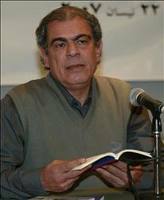 Despite numerous collections and accolades, the poet was probably best known for his constroversial 2007 poem “The Balcony of Laila Mourad,” which was condemned by Al Azhar and seized in 2008, a year that also saw the seizure of Magdy El Shafee’s graphic novel Metro and Nawal Saadawi’s play God Resigns at the Summit Meeting. Salem’s poem appeared in Ibdaa magazine, and led to the withdrawal of the magazine’s publication license in 2009. Salem also faced a hesba case to strip him of his state excellence award. “ليس من حل أمامي.. سوى أن أستدعي الله والأنبياء.. ليشاركوني في حراسة الجثة.. فقد تخونني شهوتي أو يخذلني النقص.. الرب ليس شرطيا حتي يمسك الجناة من قفاهم.. إنما هو قروي يزغط البط ويحبس ضرع البقرة بأصابعه صائحا: وافر هذا اللبن.. الجناة أحرار لأنهم امتحاننا الذي يضعه الرب آخر كل فصل قبل أن يؤلف سورة البقرة.. الرب ليس عسكري مرور.. إن هو إلا طائر.. وعلى كل واحد منا تجهيز العنق.. لماذا تعتبين عليه رفرفرته فوق الرؤوس.. هل تريدين منه أن يمشي بعصاه في شارع زكريا أحمد.. ينظم السير ويعذب المرسيدس”. And it falls to us to prepare the neck. Why blame him for flying overhead? “Whoever imagines another meaning has bad intentions,” he said. I don’t believe that Salem’s work has ever been translated into English. Only days ago Helmi Salem was reading a new poem, “Miracle of Breathing,” in a gathering at the leftist Tagammu Party, insisting on leaving hospital despite his severe condition of lung cancer and liver failure, saying, “Poetry heals better than one thousand chemotherapy sessions,” refusing to be a selfish thief, “dying in my comfortable bed in hospital while others died in the Egyptian squares.” Keep reading.